If you find salmon on sale around Christmas time, gravlax makes a substantial appetizer to serve at your holiday gathering. Gravlax is an elegant addition to your appetizer repertoire. Raw salmon is cured for a few days in the refrigerator with sugar and salt; that’s about it. There are differences in the tastes of the various salmon, but the most important thing is to buy fresh or appropriately frozen fish. If your fish has been frozen, ask the fishmonger if it was flash frozen on the boat. Flash frozen means the fishermen themselves freeze the fish right after it is caught. This way, when it is defrosted, it is as close to fresh as frozen can be. However, for the Easy Homemade Gravlax, please use fresh salmon. If you are going to be poaching, roasting, or otherwise cooking your salmon, flash-frozen fish is fine. Remove any small white bones embedded in the flesh, called pin bones, with needlenose pliers. Locate the bones with your fingers — they’ll feel like a splinter. Grab the end with the pliers and pull out, working with the direction of the bone’s insertion angle. They are in one line, so find one and work your way down the fillet. 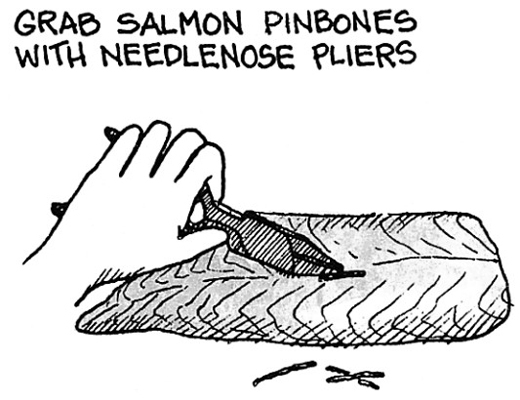 Pull the pinbones out of salmon. Line a large glass baking dish with enough plastic wrap to cover the bottom completely and with enough to overhang the edges. Place the salmon, skin side down, in the dish. Crush juniper berries and peppercorns with a mortar and pestle or place them on a work surface and crush with the broad side of a heavy chef’s knife. Combine with salt and sugar and sprinkle the mixture evenly over the salmon. Spread the dill over the fish. Drizzle the gin over the fish as evenly as possible. Juniper berries are available in health food stores or other stores that have bulk herbs. Buying herbs in bulk, by the way, is the most cost-effective way to get them. Although the berries are optional, use them if you can find them. Wrap the plastic up and over the fish. Place a pan or plate that fits inside the baking dish over the fish. Weigh down the fish by placing heavy canned goods on top of the pan or plate. Place in your refrigerator for three days; the fish should have lost its translucence by the time you serve it. Unwrap the fish and scrape off the dill, salt, and sugar. Slice the salmon thinly on the bias, leaving the skin behind. Place the gravlax on a serving platter surrounded by a crock of sweet butter and sliced dark bread. Garnish with fresh dill and serve.